Democrats also got good news in the congressional generic ballot polling. Quinnipiac 3's national survey showed Democrats with a notable nine percentage point edge (43%-34%) on the generic ballot, which asks respondents whether they plan to support a Democratic or Republican candidate in the next U.S. House race in their district. Public Policy Polling 4 and Rasmussen 5, two other firms, showed Democrats leading by five and four points, respectively, in other surveys that came out this week. These polls aren't yet predictive, but the results are noteworthy nonetheless -- all three pollsters showed an uptick for Democrats from their prior survey. Does this mean that the House is in play? Not necessarily: We continue to believe that the Republicans are strongly favored to hold control of the House 6, although we're less certain that Republicans are better positioned to add seats. Given the natural advantages 7 Republicans have going into this midterm, the blame for a collapse -- if it indeed happens -- probably could be summed up in a Radiohead lyric from a song (“Just 8”) released around the time of the last government shutdown: “That's what really hurts/ Is that you do it to yourself/ Just you and no one else.” Simply put, there's no reason why the House should be in play this cycle, and if it is in play the Republicans will have only themselves to blame. It's worth noting that after the last unpopular government shutdown in 1995-96, the Republicans under Speaker Newt Gingrich retained the House in the 1996 elections. It is equally of note that the GOP lost nine seats and also lost the popular vote for the House -- a rare occurrence that last happened in 1942 (when the Democrats retained the House even though the GOP won the popular vote in the midst of World War II). In 2012, of course, thanks to artful redistricting and the high concentration of Democratic votes in urban areas, Republicans won a 234-seat majority while dropping the popular vote for House by nearly 1.4 million votes. Whenever the shutdown ends -- and when the debt ceiling is raised (assuming it is) -- it will be interesting to see how the various votes go in the House. Already, Republicans from more moderate districts are trying to differentiate themselves from the more conservative members of their caucus. For instance, Rep. Scott Rigell (R, VA-2), who represents a competitive Hampton Roads district, has said he would vote 9 for a “clean” continuing resolution to fund the government without affecting the Affordable Care Act. Rep. Peter King (R, NY-2), whose Long Island district gave Obama a greater share of the vote in 2012 than it did in 2008 (52% last year versus 51% five years ago), said 10 that there are “40 Ted Cruz Republicans in the House running national policy.” While that's probably not a winning message for King's possible 2016 Republican presidential run, it might be appealing to his constituents, some of whom woke up Tuesday morning to a New York Daily News front page 11 sporting the headline “House of Turds,” featuring Boehner as Kevin Spacey's character 12 from the popular Netflix show House of Cards. It's possible that the most important votes of the 113th Congress will be the ones eventually cast to fund the government and/or to avert a default. Historians may eventually compare a shutdown or debt ceiling vote to the most consequential vote from the 111th Congress, HR 3590 13: the Patient Protection and Affordable Care Act, passed by the House on March 21, 2010 (which the Republicans are now trying to use this current budget battle to undo). The final House vote on Obamacare was 219-212, with 34 House Democrats joining all Republicans in dissent. Academic studies 14 have shown that Obamacare was a driving force in the Democrats' devastating 2010 midterm losses, in which 66 previously Democratic seats flipped to the Republicans. Notes: Members in bold are still in the House. “2008 Obama” refers to the percentage of the vote he received in each member's district. Source: Obama's 2008 district data 15 via Daily Kos Elections. The 2010 wave created the final nudge Republicans needed to force out many of these Democrats, some of whom were living on borrowed time in districts that Democrats had no business holding. For instance, two conservative Democrats who lost in 2010 -- Reps. Gene Taylor (D-MS) and Chet Edwards (D-TX) -- occupied two of Obama's 20-worst performing districts in 2008. In an era of increasing political polarization 16, and where the number of congressional districts with split presidential/congressional results is historically low 17, the 2010 wave in many cases simply aligned these districts with their presidential voting preference. Before the 2010 midterms, Democrats held 31 of Obama's 150-worst performing districts in 2008. Now, Democrats hold only three of Obama's 150 worst-performing districts in 2012. To flip that around, Republicans currently hold only one of Obama's 150 best-performing 2012 districts: CA-31, held by Rep. Gary Miller (R), gave Obama 57.2% of its votes, his 148th-best district. 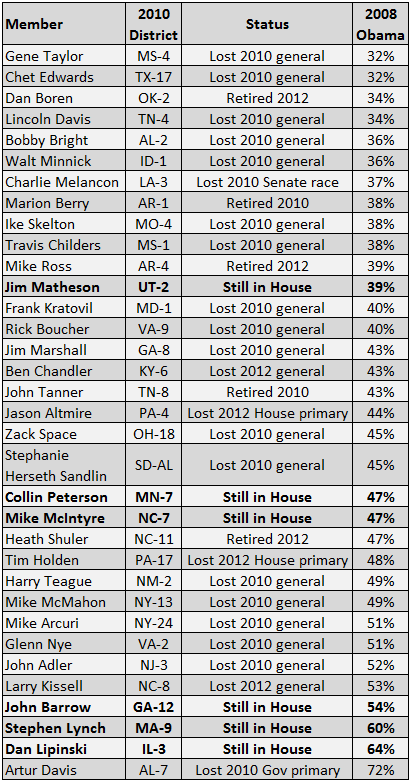 Republicans just aren't exposed this cycle the way Democrats were in 2010, but should any Republicans pay a price if the political environment goes south for the GOP next year, it probably would be some of these 25 members of Congress (Chart 2) who sit in Republican-held districts where Obama did the best in 2012. Source: Obama's 2012 district data 18 via Daily Kos Elections. Rigell and King, noted above as members who are trying to distinguish themselves from their more stridently conservative colleagues, are on this list. Many of these members are potential votes to eventually fund the government in order to end the shutdown. But because they sit in marginal districts, those votes might not protect them if the national environment takes a turn for the worse for Republicans. Let's be clear here: This is largely a thought experiment. 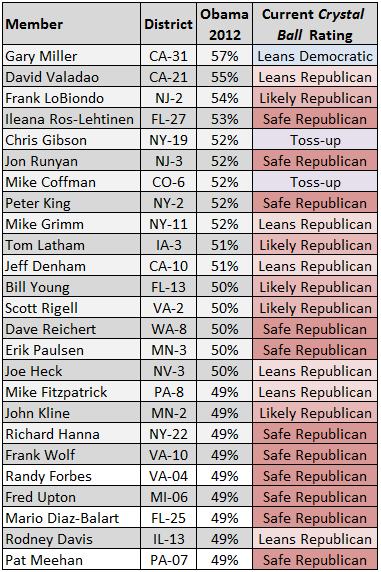 Republicans have plenty of things going for them in the 2014 midterms. There's no historical precedent 19 for the president's party to take over the House from the other party in a midterm; indeed, history tells us that the “out” presidential party -- in this case, the GOP -- is likelier to gain seats than the “in” party. The president's approval rating as measured by the HuffPost Pollster average 20 is actually worse today -- 43.4% approve, 51.0% disapprove -- than it was right before the 2010 midterm (45.1% approve, 49.9% disapprove). As we've shown recently 21 -- and as Prof. Arrington's piece indicates 22 -- Democrats are going to have to really dominate the House generic ballot, and Election Day national House vote margin, to have a real chance at taking back the House. However, if Republicans do open the door to the Democrats in the House, it's not going to be the “Ted Cruz Republicans” who will pay the price. Rather, it's the House Republicans in marginal districts who could see their ranks decimated, just like the House Democratic moderates whose anti-Obamacare votes couldn't save them in 2010. So let's keep tabs on how members vote in the pivotal roll calls ahead, but let's also remember that if the field tips one way or the other, those votes might not mean all that much. Associate Editor Geoffrey Skelley contributed to this piece.